More quotations collected by Carolyn Wing Greenlee. 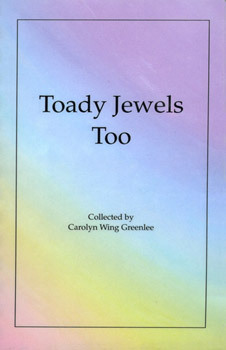 Gathered during a time of many deaths and serious illnesses of friends and family, Toady Jewels Too can comfort others in similar sorrows. Subjects include Love, God, Ministry, Beauty, Life, Death, People and the Communication Arts.